Before (left) and after (right) – what a difference! Ninety days. 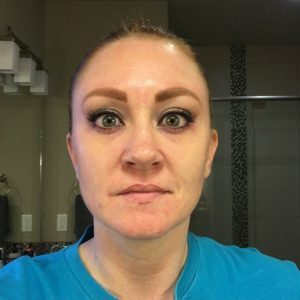 I spent twenty years fighting the acne on my face; feeling frustrated and depressed about the fact that nothing worked. It took a 90-day journey with the right people, the right products, and the right regimen to clear my skin. Y’all – I left my house today WITHOUT ANY FOUNDATION OR CONCEALER ON MY FACE! I went to Target without any makeup on (okay, my eyes were done – but that was it)! I honestly do not remember the last time I was able to do this without feeling incredibly self-conscious. No joke; I might have been a child the last time. In trying to put my thoughts and feelings into words for this piece, I found myself writing, “grateful”, “unbelievable”, and “incredible” a lot. I think these are the most accurate descriptions of my experience throughout these three months. When Melissa and I first discussed the holistic acne treatment program, she assured me that, if I followed the protocol, I would have amazing results. 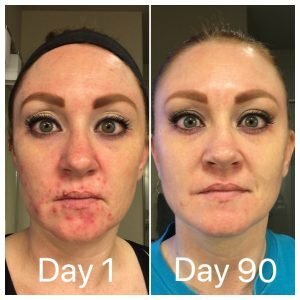 I have to be honest, I didn’t totally believe that my skin would be clear in 90 days. But I trusted her, and I trusted the program – so much so, that I promised to share my experience with the world, even taking photos of my face in all its inflamed spotty-ness. Taking these photos without any foundation or concealer on my face every week was difficult – posting them online is the epitome of vulnerability for me. But I trusted Melissa, and I trusted the program. I implemented the changes and the results speak for themselves. I am incredibly grateful to her for taking me on this journey. So, that’s my journey. If you’re suffering from acne and feel like your skin will never be clear, I hope these posts have helped you to see that you’re not alone – and that there is hope. 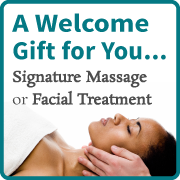 Don’t wait a second longer – get yourself scheduled for your consultation with a Soak Spa acne expert today. In 90 days, you will be so very glad you did. Thanks for following along with me on my journey to clear skin.